In Abruzzo, on the Adriatic Sea, at the end of each harvest, Lino and Francesco Ricci create a special oil for their family and friends. 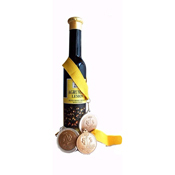 In their "frantoio", or olive mill, they crush and press small amounts of hand-harvested olives with fresh lemons to create their award-winning Agrumato Lemon Olive Oil. The crisp freshness of Agrumato is achieved by the whole-fruit crushing process. The lemons are crushed simultaneously with olives in the traditional cold-extraction method to capture essential oils and juice from the citrus fruits. From the resulting agrumato, is an intensely golden green oil, fully loaded with bright citrus flavor and aroma. Used by some of the finest restaurants in the world, Lemon Agrumato is an exquisitely versatile condiment. Bright and crisp with a lemony zing, it is a perfect finishing oil that complements grilled fish and poultry beautifully. Whisk into salad dressings, drizzle over hot pasta, roasted vegetables or fresh greens - the possibilities are endless! Agrumato oils come from an ancient culinary tradition known in the Abruzzo region of Italy, near the Adriatic Sea, east of Rome. For years, at the end of each harvest, olive farmers who owned a "frantoio", or olive mill, would crush and press small amounts of hand-harvested olives with fresh lemons to create oil for use by their family and close friends. Our Agrumato comes from Lino and Francesco Ricci, who, since 1992, have produced Agrumato with Lemons, Oranges and Tangerines for new versions of these treasured oils. Producing Agrumato oils is a labor-intensive and time-consuming process. The olives are harvested entirely by hand and the citrus fruits are carefully picked at the perfect point of ripeness. The olives and whole fruits are then crushed together in a traditional stone mill. The resulting paste is immediately pressed under low pressure and the juice is centrifuged, separating the water content from the oil. 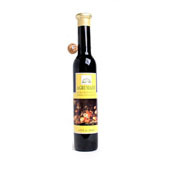 Only oil from this first pressing is flavorful enough to produce this very rare and precious extra virgin olive oil. By crushing the whole fruits, the purity of each fruit flavor is maintained. The resulting oil is exquisite, producing a flavor and aroma that cannot be duplicated by the more common infusion method of other citrus flavored oils. 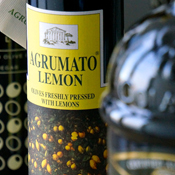 Golden green, with the aroma and flavor of Mediterranean citrus fruits, Agrumato is a unique and versatile condiment.